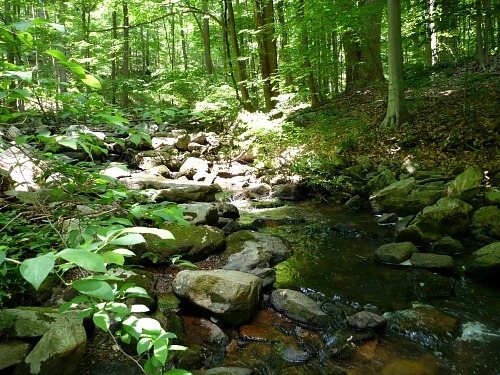 Coach and I had planned to hit three New Jersey streams on June 22 to see how many species we could catch with a black Killer Bugger. He got a late start in the TenkaraBum Challenge, but you can bet he'll make up for it. We both ended the day with ten species caught, but they weren't the same ten. Our first stream of the day. Our first stream was one we fish often. On past trips, I've always caught brown trout and fallfish, and have caught common shiners twice and blacknose dace once. On this trip I caught several fallfish, a common shiner and a few brown trout. 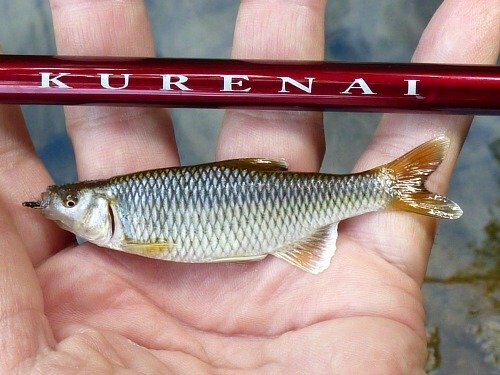 This is the largest fallfish I've caught in that stream. 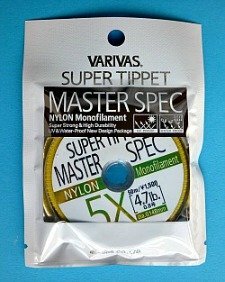 The stream is fairly small and I've almost always fished it with unweighted flies - which never get more than a few inches below the surface. I caught this fallfish with a modified keiryu rig: 5X tippet material for the line, yarn "markers" for strike detection and a split shot about 8" above an unweighted Killer Bugger. The shot allowed me to fish deeper than I've ever been able to in the past, and this fish was taken in one of the deepest holes. 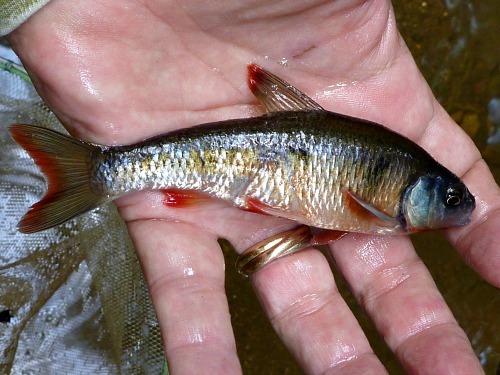 This shiner was in spawning colors, which I'd never seen before. 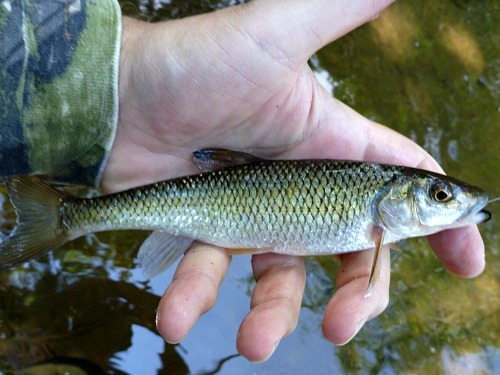 The common shiners I'd caught before were all on an upstream, dead drift presentation with an unweighted fly. 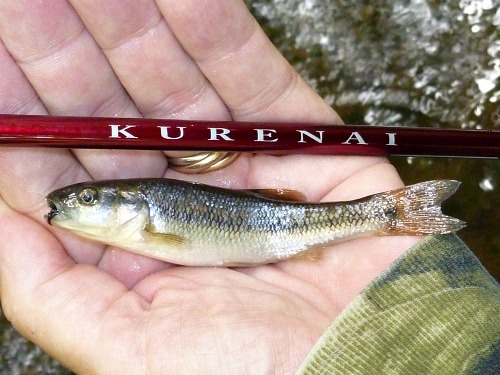 This one was caught with a keiryu rig, and the split shot got the fly to the bottom. I let it drift under a tree branch and slowly dragged it upstream. Tap, tap - fish on! 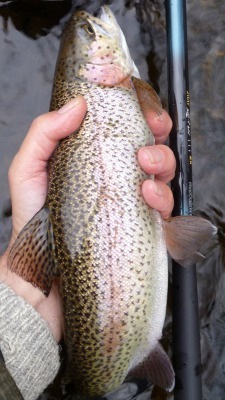 The same pool where I'd caught the fallfish also yielded a couple trout. 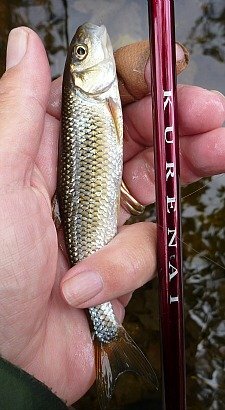 As with the fallfish, I was able to fish considerably deeper than before by using a keiryu rig with a split shot to get the Killer Bugger deeper. This isn't the best trout in the stream by any means, but it is larger than the ones I usually catch. We soon left this stream. Coach had caught the same three species I had, and it wasn't worth staying longer on the chance of catching a blacknose dace - which I've also caught in the next stream on our list. Our second stream of the day. Our second stream is a tiny, high gradient stream in which I've caught brook trout, creek chubs and blacknose dace in the past. We've always caught brookies there - except for this trip. We both blanked on the brookies - and I didn't catch any blacknose dace. We both caught creek chubs, though. We both tried small flies, a 26 for me and a 20 for Coach, but we only caught fish on size 12 and 14. We spent longer here than we had anticipated, as we both wanted to catch a brookie. It just didn't happen. Coach had a long distance release and I had a bump that seemed a bit too strong to have been from the size chubs I'd caught in that section of the stream, but neither of us got a brookie into the net. Our third stream of the day. I realized when writing this report that I've never taken a photo of the third stream. I don't know why not, other than it's not particularly photogenic. 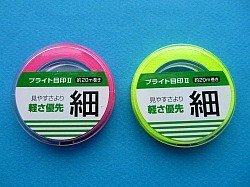 It is the largest of the three, and it is a warm water stream. I've heard the state stocks trout in it, but I doubt they make it through the summer. Coach saw a couple he thought were rainbows, which he tried to catch for a long time (time that he could have spent just a bit further upstream, where I was catching satinfin shiners one after another). The first time I fished this stream I was surprised how many species it held. On that day, I caught bluegills, green sunfish, redbreast sunfish, rockbass, creek chubs, satinfin shiners, spotfin shiners and banded killifish. I didn't catch as many species this trip. Almost, but not quite. 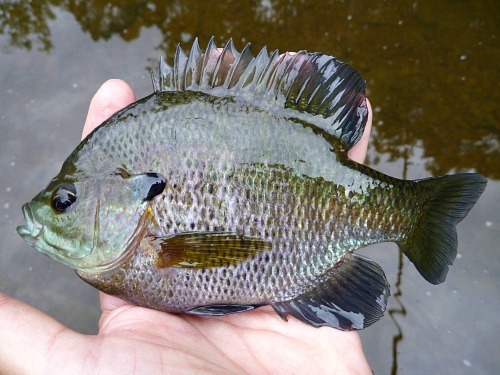 My first fish in this stream was a green sunfish. 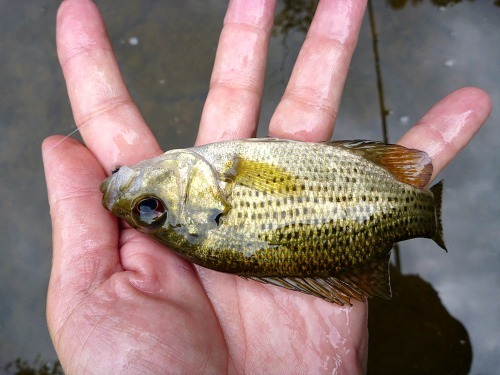 My second catch in this stream was a Rock Bass. They held in slightly deeper water so we could either catch them or avoid them depending on where we fished. My next fish was a bluegill - a particularly dark green and purple bluegill. 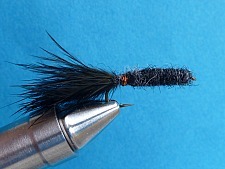 Bluegills seem to be everywhere and they are easy to catch - at least they are on a black Killer Bugger, which has turned out to be a remarkably effective fly for any of the sunfish species I've fished for. Next came a smallmouth bass. 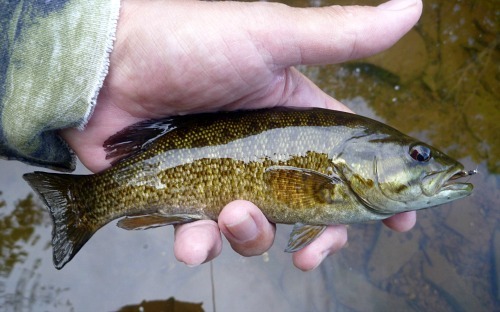 I'd seen some smallies on my previous trip to this stream but I hadn't caught one then. This guy was right alongside a bridge abutment, where I'd seem some swirls that were much too large to have been sunfish. All it took was one well-placed cast. This is one of the species that I caught and Coach didn't. The other was the satinfin shiner. He caught a pumpkinseed and a black crappie that I didn't (both from this stream). I'm really impressed with the species diversity of this stream. 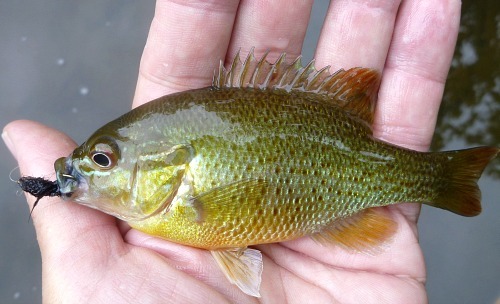 The next fish was a redbreast sunfish. 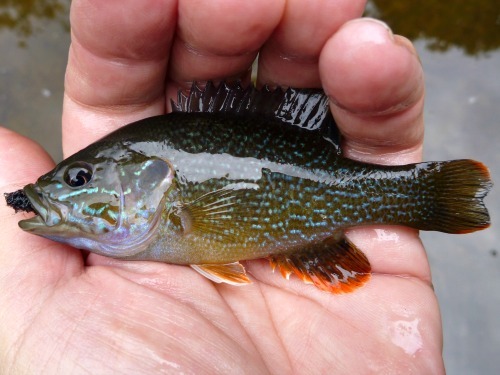 The redbreast sunfish were funny. I've often quoted a line from The Curtis Creek Manifesto - Frightened fish can't be caught. Well, it seems like the redbreast sunfish were fearless. They would just hold their position looking at me as if they were waiting for me to feed them. 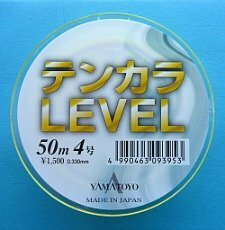 They were really too close to cast to (and everybody knows tenkara isn't dapping) so I cast just beyond them. They'd turn around at the sound of the plop as the Killer Bugger hit the water and then go eat it. 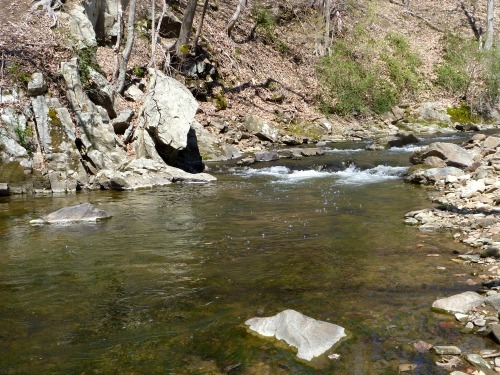 After the redbreast sunfish I went upstream to where I'd caught satinfin shiners and creek chubs on my previous visit to this stream. I didn't really care about the chubs since I'd already caught them today. I did manage to catch the shiners, though. Quite a few, actually. They took a size 26 black Killer Bugger pretty regularly. I'm really impressed with the species diversity of the stream - which definitely makes me want to explore more of the warmwater streams in my area. I would be surprised if, just by chance, we hit on a remarkably fertile stream. I suspect a lot of the other streams in the area are also pretty rich in terms of the number of species they hold. Not long after we'd gotten there a couple other fishermen came by and asked us how we were doing. We said we'd caught a couple small ones (standard answer, although the truth was closer to a couple dozen). They said they'd never caught anything in this stream - which given the number of species and number of fish I find almost incomprehensible. Then again, maybe all fishermen really are liars.